Amy & Neil’s wedding at the Kampong was just so beautiful. Really, I love this place and can’t wait to go back this coming year. 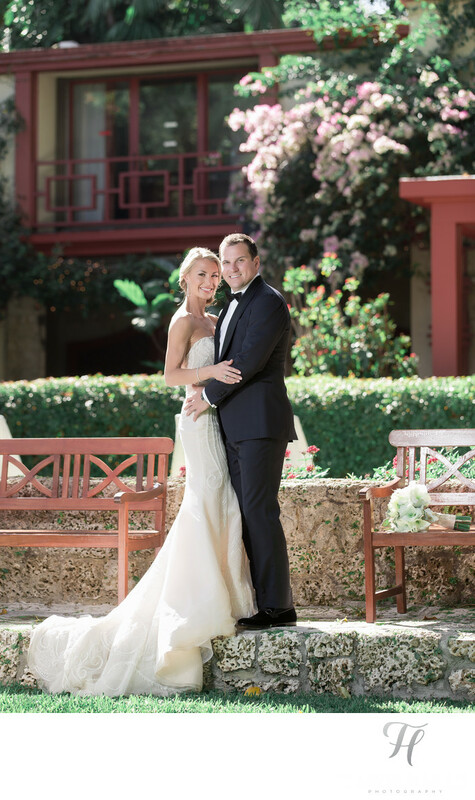 Kampong Weddings in Miami are truly special, and offer so many incredible places to capture Wedding Photos. The image (above) is just a nice, solid, traditional, lets put this in a nice frame for the fireplace kinda shot. It show’s them, nice expressions, just beautiful lighting and if you look close even Amy’s beautiful flowers sitting on the edge of the bench. Lighting here was late day sun shining at their backs, this gave a pretty nice “separation” from the background, and then I used a 400watt studio light to balance things out. I don’t think I even used any diffusion on this one. A shot like this is what I often refer too as "practical application". This is a shot that as I said would look nice in a frame, or a wedding album along with other creative shots (as you will see in the next shot). In the previous shot I was speaking about rain on the wedding day, well.. this is one location where you don't want any rain.. it really needs the sun, and thankfully we had that on Amy's wedding day and everything turned out VERY nice! Location: 4013 South Douglas Rd Coconut Grove , FL 33133.